Follow the below steps to prepare HTML and CSS mark up. First thing, create a simple HTML snippet to store slide show images which can be used for slide show. The MainDiv holds all the jQuery Slider images and navigation buttons to control the slider. Remember it is very important to set position of MainDiv to relative. So it positions element relative to its normal position. The div element which have className is slider that holds all slider images. Now, write CSS for slider. Create two navigation buttons. One is prevButton and another is nextButton to control the jQuery Slider. The #slider-nav holds the navigation buttons. Position absolute tells the browser to remove selected elements from normal flow of the document and will be placed in exact location of web page where one want and give top:50% and right: -15%. It displays the selected elements -15% from the right and 50% from the top of MainDiv. HTML and CSS part of the slider is completed. 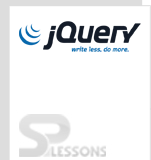 Let’s move on the jQuery part. var slider = $(".slider ul"), // First thing find the selector. (direction == "next")? ++current : --current; //If it is true increase the value of current. current = imgLen;  // set last image to current image. loc = totalImageWidth - imgWidth; // update current location of current Image. direction = "next"; //set direction to next. current = 1; // set first Image to current Image. loc = 0; // update current location of current Image. direction = "prev" ; //set direction to prev. transition(slider,loc,direction);  //animate the left or right margin of the sliders list with the values. Create a HTML snippet,set position of element to relative,add navigation buttons using #slide-nav.